I have a little more to show for Scrap Saturday. I have been working on the Rainbow Scrap Challenge 2012 all year. Hard to believe we are in the home stretch for the year, three and a half months left. I am going to do more next year too. I just love working on different blocks each month. I still need one more of these 12 inch blocks in orange before the month is up. 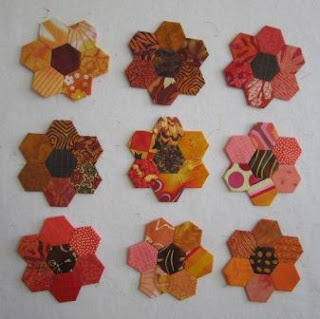 Here are 9 orange hexagon flowers done so far. I only started to make these last month in the turquoise. I guess you could say I have more work to do on these. I am thinking I will appliqué these to a base but I am not sure what or how I will use them. The spools are part of the Leaders and Ends Challenge that Bonnie Hunter put out around Aug 20th last month. I love these little 3 inch spools. I did get a few more done this week. All my orange so far this month. 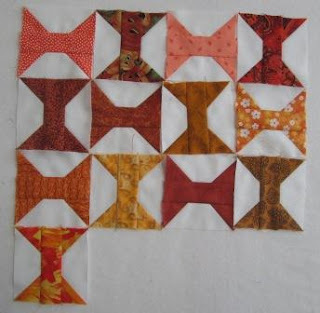 I have added this post to Soscrappy linky party, go see the other orange going on this month. I picked these last night just before supper. Good thing we got frost last night. I was not excepting frost and did not pick or cover my tomatoes next to the house, we will see if I will get damage or not. Do you see the big kid on the lawn tractor in the far background. Crazy grass keeps growing, maybe the frost will slow it down. All your orangey projects look great! I started cutting some orange fabrics for the spool leaders & enders. I was going to use miscellaneous "lights" for the background fabric, but I really like how your white background looks. Might have to reconsider! 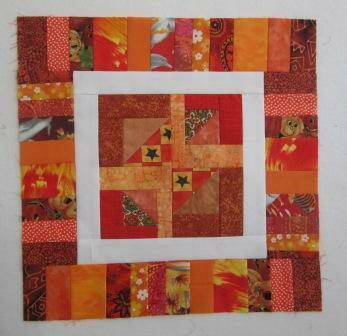 I am happy you are able to find and use up so many orange scraps! They don't ever seem to go away though, so it is all about the process. I saw a great hexie flower applique quilt somewhere. I'll have to see if I can find it again..... Isn't that always the problem with great ideas. So hard to remember where they came from initially. I love your orange blocks! Can't believe this year is almost over. I want to do this rainbow challenge again next year, too. Wow! You've been very busy with your orange scraps!!! I'm doing good just to get a couple pineapples done, and you're doing hexies and spools and everything in between :*) Way to go!!! Beautifull blocks all of them! Oh MY Cathy you've got so much done! They are all fabulous too! I must get to mine. Love all the orange projects. Frost..... I actually MISS that! Cooler temps in the evenings for jeans and a sweat shirt..... 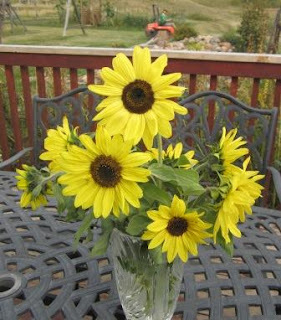 I think I need to make a trip up north =). If we get a low in FL it's around 70 right now around 5AM.... back close to 90 in the day.